Spain is a voluptuous country. Not only because of the local Iberian cuisine. It is also a lack of haste and a slow pace of life. Its culture and casual people with their easy-going outlook on life which does not have a specific pattern or scheme to follow. Probably the only daily routine is dictated by the sun making people lazy. So called siesta. The consequence is the mañana phenomenon, which is the notorious postponing of one’s duties for the following day, which in practice takes weeks, months and in the extreme cases, simply never comes round. Experiencing Span can be tiring, even unbearable for inflexible people. On the other hand, some would find the Spanish culture quite favorable adjusting quickly to its heartbeat. I move straight into the middle of Spain. My plane arrives at Bajaras airport in Madrid. This is one of the worst organized airports I’ve ever seen. From the airport, my friend receives. 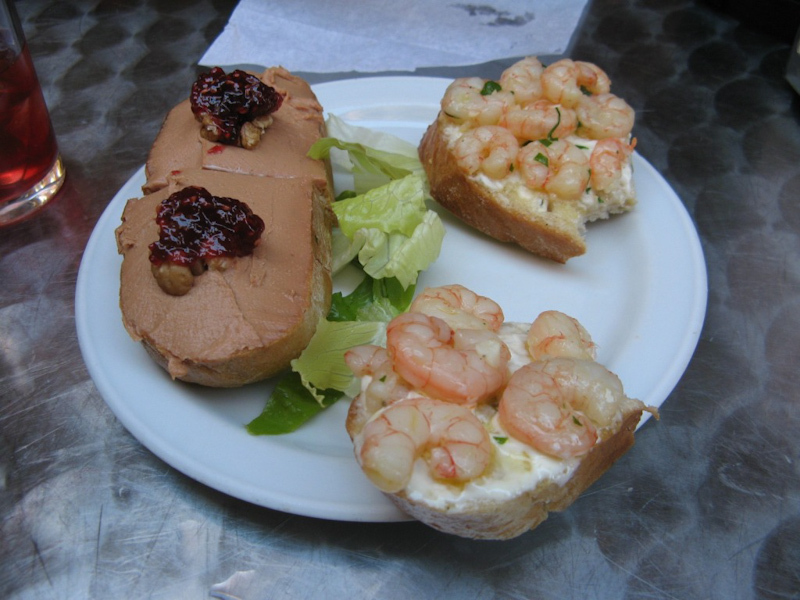 We go to her apartment in central Madrid right to the authentic Spanish feast. We wrap pieces of juicy melon with a slice of jamón curado. Togehter with a thick potato tortilla is a true taste of the Iberian peninsula. After our feast in the apartment on Calle de Carranza was go out to the nearby festival which takes place on the Plaza de Chueca. Crowds of people are rampaging the large square and its surrounding narrow streets. The wine is everywhere and celebrations lasts until dawn. I recommend a large city park Casa de Campo to spend warm summer evenings. This is a place where after 10 PM many groups of people gather up on the grass. Throughout the park you would hear people laughing and engaged in loud, temperamental conversations. We drink sangria and vino tinto de verano. Someone begins to play the guitar and such a good mood stays until late at night. Obviously I took my longboard with me to Madrid. The pavements quality for riding the board unfortunately is worse than in Barcelona. Nevertheless, keeping track of the surface of individual roads just after a few days I came up with several interesting routes to cruise the city. Fuencarral is a street connecting two subway stations, Bilbao and Gran Via. On both sides it is filled with cozy boutiques. This is a very popular and busy place during the day but at night it becomes an ideal downhill route to access the city center. This is one of a thousand examples. Parque del Retiro is a place of cult for longboarders, roller skaters, joggers and all the other lovers of active lifestyle. In this park, just like in the U.S., there are occasionally set-up drinking water fountains. Indispensable when the unbearable heat is on. Patricia, whom I met a few years ago in Nottingham lives in el Escorial nearby Madrid. We arrange a meeting at Agruelles station and head for a bit of sightseeing. We start from the most classic places. 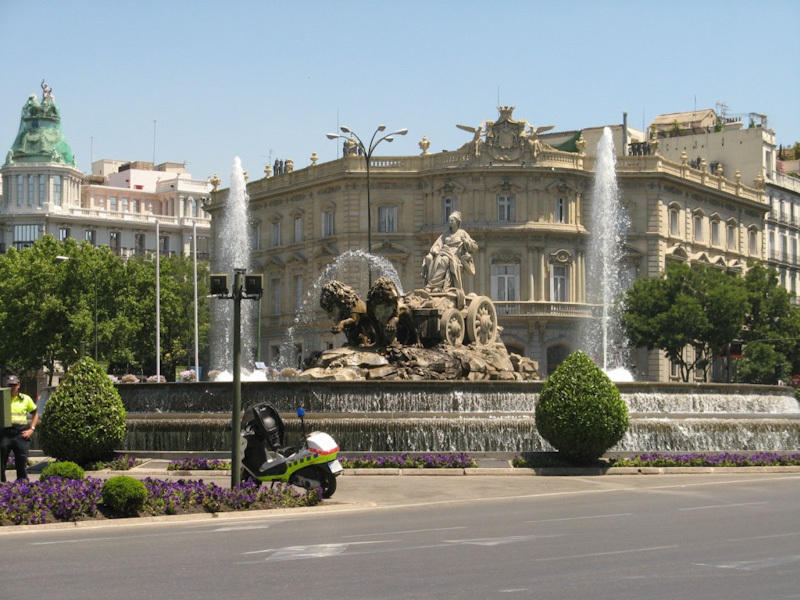 Sumptuous Palacio Royal, the royal palace with gardens and carefully trimmed shrubs around has a strategic location overlooking a large part of the city. Plaza Mayor is a big square with the structure resembling old markets in Poland without the city hall located in the middle. The square is crammed with restaurants and open-air bars all around clinging to the inside walls. The central point is a statue, around here we meet mimes and lots of other street artists. My greatest appreciation goes to a guy pretending to be a mud-man, by covering himself in mud and spending all day long in a scorching 40-degree heat. Patricia introduces me to some typical Spanish flavors. I get to know different varieties of jamón, which become my fascination. We visit bars hidden in the narrow streets. The pride of each of these places is the number of decades of continuous operation. In Sol there is a phenomenal cake shop, where for over a hundred years you can buy exactly the same confectioneries. The napolitana served here is by far the world’s best creamy cake. With every location being peculiar, visiting Madrid is like being on a real journey into the thousands of traditions cultivated by generations. I visit the museum of ham, Museo del Jamón, where we not only see but also buy all kinds of jamón curado and Jamón Iberico. Also many other products straight from the Iberian butcher. Just ask to get your bocadillo con jamón ready (a baguette with a solid and fat jamón slice of your choice). I get to know a girl from Andalusia. Ana takes me to Lavapies, a place popular among immigrants from South America. Residents stay out in the fresh air and play with their children. We sit in the shade, have a large one liter beer together and speak Spanish. It is nice to hear interesting stories of a girl who has recently returned from Ecuador. She came to Madrid to complete the paperwork before her next anthropology research project in Peru. It is also nice to hear that someone in Spain reads books of Ryszard Kapuscinski, an unquestionably greatest Polish reporter and writer. Even in the capital with a bit of luck you can find a bar with some special deals. A half-liter beer or the same size vino tinto de verano cost only €1. Speaking of bars and eating various snacks I became really into trying out various tapas. The varieties are infinite. An excerpt of the menu may include a shrimp baked with garlic butter, a rabbit pate with walnuts and cherry jam or baked calamari in chilli sauce. 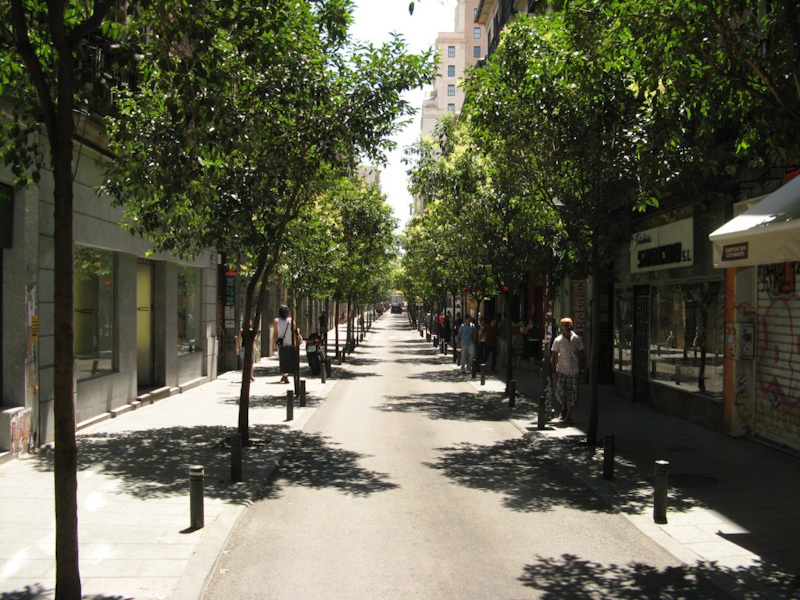 The vine-shaded street is comfortably protected from the afternoon heat. The bar we sit in has it all we need today. Spain is both relatively cheap and interesting country. Not only because of the corrida, olives, red wine, jamón curado and thousands of different tapas. It is primarily a country full of sunshine and the southern temperament.